This chapter illustrates how to apply continuation techniques in the analysis of a particular class of nonlinear kinetic equations that describe the time evolution of a single scalar field like a density or interface profiles of various types. 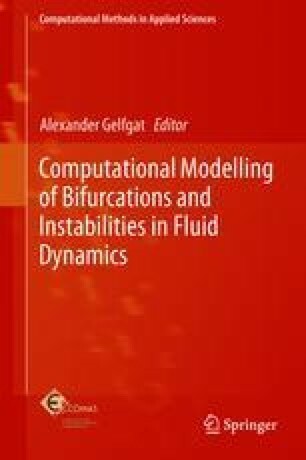 We first systematically introduce these equations as gradient dynamics combining mass-conserving and nonmass-conserving fluxes followed by a discussion of nonvariational amendmends and a brief introduction to their analysis by numerical continuation. The approach is first applied to a number of common examples of variational equations, namely, Allen-Cahn- and Cahn–Hilliard-type equations including certain thin-film equations for partially wetting liquids on homogeneous and heterogeneous substrates as well as Swift–Hohenberg and Phase-Field-Crystal equations. Second we consider nonvariational examples as the Kuramoto–Sivashinsky equation, convective Allen–Cahn and Cahn–Hilliard equations and thin-film equations describing stationary sliding drops and a transversal front instability in a dip-coating. Through the different examples we illustrate how to employ the numerical tools provided by the packages auto07p and pde2path to determine steady, stationary and time-periodic solutions in one and two dimensions and the resulting bifurcation diagrams. The incorporation of boundary conditions and integral side conditions is also discussed as well as problem-specific implementation issues. DW thanks the Deutsche Forschungsgemeinschaft for support (DFG, Grant No. Ue60/3-1); HU thanks Jens Rademacher for discussions on suitable formulations of constraints for Hopf orbits; UT acknowledges funding by the German-Israeli Foundation for Scientific Research and Development (GIF, Grant No. I-1361-401.10/2016); and SG acknowledges partial support by DFG within PAK 943 (Project No. 332704749). We thank Daniele Avitabile, Andrew Hazel, Edgar Knobloch, and David Lloyd for frequent discussions on continuation techniques, bifurcation theory and pattern formation.